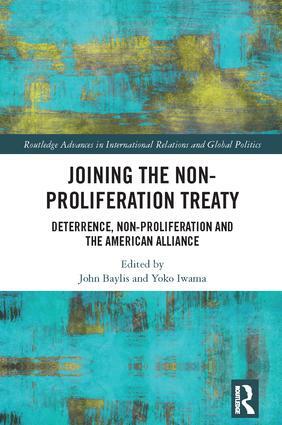 What were the calculations made by the US and its major allies in the 1960s when they faced the signing of the Non-Proliferation Treaty (NPT)? These were all states with the technological and financial capabilities to develop and possess nuclear weapons should they wish to do so. In the end, only the United Kingdom and France became nuclear weapon states. Eventually, all of them joined the non-proliferation regime. How imperative was nuclear deterrence in facing the perceived threat to their country? How reliable did they think the US extended deterrence was, and how costly would an independent deterrent be both financially and politically? Was there a regional option? How much future was there in the civilian nuclear energy sector for their country and what role would the NPT play in this area? What capabilities needed to be preserved for the country’s future and how could this be made compatible with the NPT? What were the determining factors of deciding whether to join the NPT? John Baylis is Emeritus Professor of Politics and International Relations, and a former Pro-Vice Chancellor, at Swansea University, UK. Yoko Iwama is Professor of International Relations at the National Graduate Research Institute for Policy Studies (GRIPS), Tokyo, Japan.